Thursday Cottage was started in 1963 in a cottage of the same name outside Spaxton, Somerset. For many years, the business was then owned and run by Hugh and Pam Corbin from Lyme Regis, until they sold it in 2002. They are now based at Trewlands Farm in Tiptree, Essex, where they still operate a small production unit where a variety of different preserves, curds and marmalades are made by hand. The ingredients, the open pan cooking and their products' distinctive taste and character are little changed from when the company was based in the West Country. They take great care in the choosing the best ingredients and grow a variety of traditional and unusual fruit close to our production kitchen. All of their products are made in small batches. They fill by hand =sometimes because it keeps the fruit whole and they believe, makes a better product. 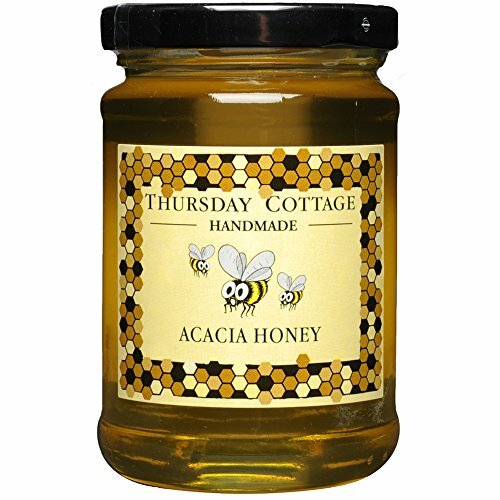 Delicious handmade Acacia Honey, a mild and delicately flavoured clear honey. If you have any questions about this product by Thursday Cottage, contact us by completing and submitting the form below. If you are looking for a specif part number, please include it with your message. Raw Honey - Rosh Hashanah Pack of 3 by Rango Honey - Pure and Unfiltered 100% Natural and Kosher Honey from Sonoran Desert - A sweet way to wish Shanah Tovah to all your family & friends!